It was difficult to select pictures to feature in this update's current Grand Marais scenes. If you would like to see others that I did not select, please visit my photo blog at www.agatelady.blogspot.com. 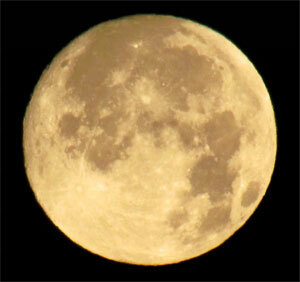 We'll start out with a shot I took the day before the full lunar eclipse, which happened on December 21st. I posted some of the photos on the blog of the actual eclipse, but I like the full moon shot the best. 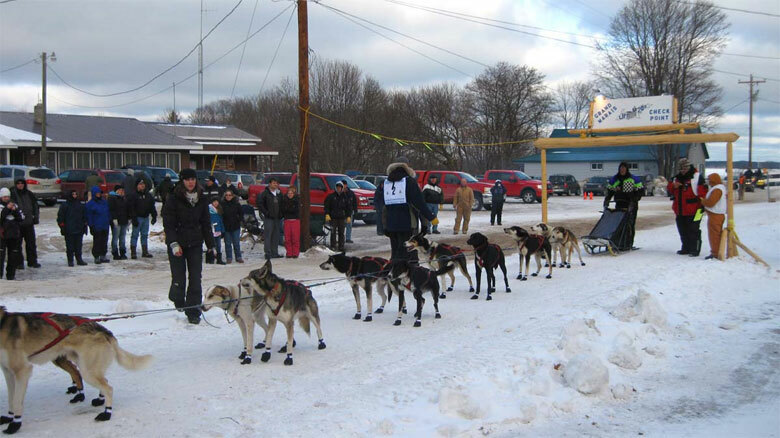 The UP 200 dog sled race took place the weekend of February 19th. The event has been going on for over 20 years. 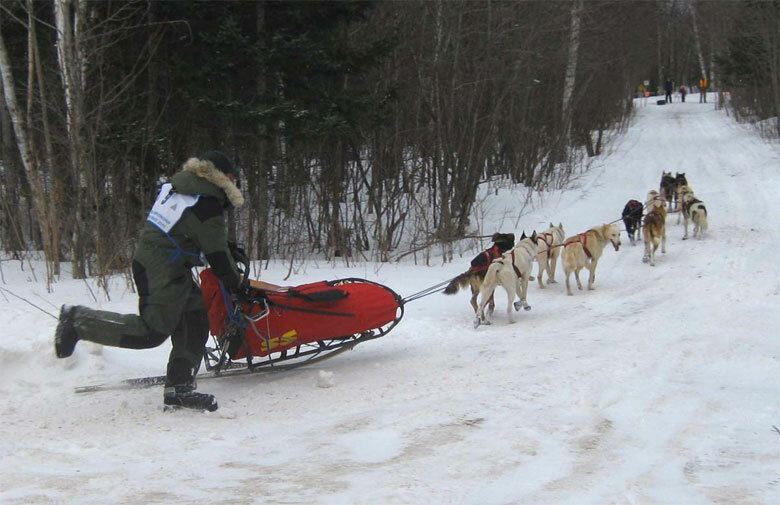 The race is limited to 40 dog sled teams, although only 19 teams signed up this year. Mushers included 8 from Minnesota, 4 from Michigan, 3 from Wisconsin, 2 from North Dakota, 1 from Ontario, and 1 from Ohio. Three women participated this year. In addition to the UP 200, there was also an 89 mile midnight run race with a route from Gwinn to Deerton and then ending in Munising. The UP 200 route starts in the Marquette area travelling east to Grand Marais and back -- usually a 240 mile round-trip distance. Because of the icy conditions, race officials shortened the race this year to end in Wetmore, which is located just east of Munising. I did decide to open the museum this year, which took some work since I had to unpack all the items from the last art show plus the things I purchased in Tucson. It worked out well so I'm glad I decided to heat the building and open. The starting gate for the mushers to continue the return trip of the race is located right in front of the museum. Fourteen of the teams finished this year's race. Ryan Anderson from Ray, MN finished first as Team 2 with a total time of 21:42:24. He finished with 11 dogs, averaged 13.2 mph and had 10:34 rest time. Nathan Schroeder from Chisholm, MN finished second as team 4 with a total time of 22:00:29. David Gill as Team 13 finished third with a time of 22:21:37. Although we certainly are still in the midst of winter here on the south shore of Lake Superior, it has been the third winter in a row with lower than average snow fall amounts. I talked with one of the local road commission workers the other day who told me that the official snow amount received in the Grand Marais area so far this year is 170 inches. They measure the snow fall amounts several miles south of town. A few years ago we had over 325 inches of snow. Below are a few winter shots taken in the Grand Marais area. First, a photo taken from First Creek located just west of Woodland Park. Notice the remnants of a snowmobile track. 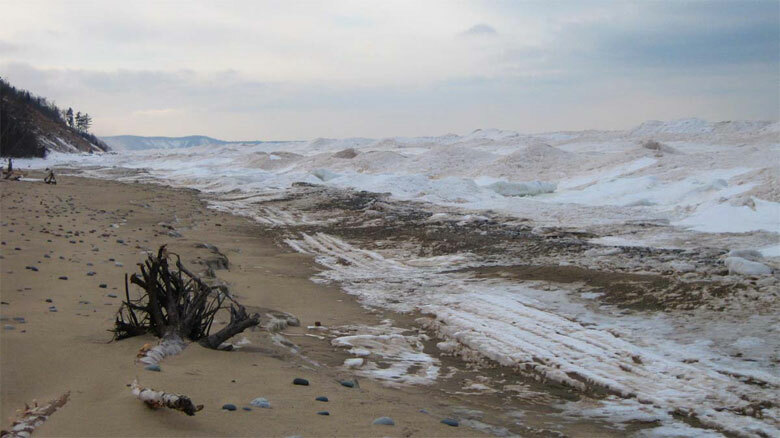 For those who are not aware, it is illegal to drive any motorized vehicles including snowmobiles on the beach. I have continued snowshoeing in the dunes this winter. Here is a picture taken from the Ghost Forest area near Sable Falls. 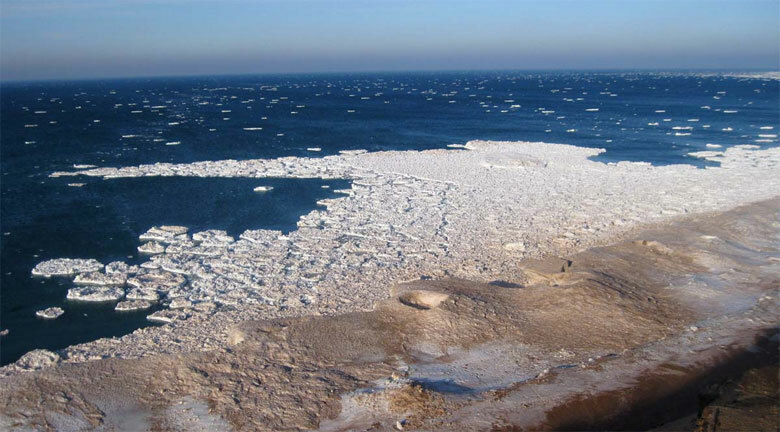 When the wind breaks up the ice, many times the smaller chunks form into floating pancake ice. Also notice the iceberg "blow hole" in the center of the picture. It is not safe to walk on the icebergs since sometimes you cannot see the blow holes as they may be covered over with snow. During a recent thaw we had alternating freezing and thawing temperatures. 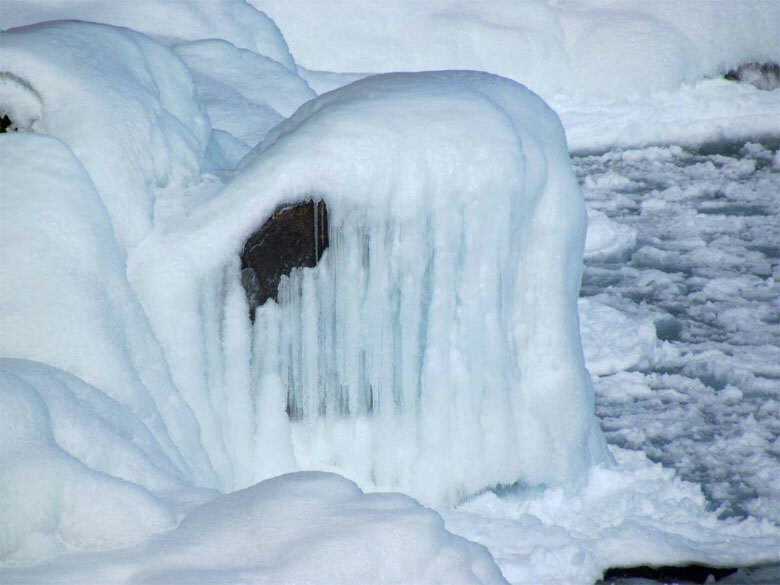 These changing temperatures can add to the beauty of the ice formations.